Any news on the Hawks intra club match? Was hoping to hear how Meadows went, played junior footy with the bloke would be great to see him get a gig! Was Worpel operating as an inside mid getting his hands on it? Is Sicily taking majority of the kick ins? I feel like my Backs & Forwards are very cookie cutter this year but its pretty hard trusting any PODs at either end. I’ve seriously considered J Short in my backline, i figure if he improves again he could really become relevant in ‘19. He had an 8 game stretch during the year where he averaged 99. Short was Tigers main kicker in and probably will get a bit of a stat boost due to kick in rule. I don’t see many people choosing the Hoff. Is there are a particular reason? He was a top 6 fwd last year, and that ruck status is really handy. I personally see him as a one season wonder & cant trust that he will back it up. He has nearly a decade of mid 80’s at best prior to last year. And the arrival of Lycett pretty much takes his fantasy friendly backup ruck role away. I’d still say around an 85-90 average if he plays wing for a bit. sell your R2 to me, stating why I should pick him… I am of great need in this department, thanks. Gawn. Cos set and forget. Tim English, should be number 1 ruck this year. Heaps of upside & plenty of cash to be made. Can sideways to Mummy if he returns in great form. Anyone else playing RDT get a email that looked a bit suspect asking to verify ID? Its very strange when i click the link to verify my account it takes me to my team…Something fishy i have emailed sportsdeck..
Got something like that last year – just ignored it (like you should ignore anything Hawk says). Didn’t affect anything. You shouldn’t of clicked the link mate. So turns out was a legit email from Sportsdeck its to do with the daily cash Fantasy from what they told me its like gambling so you need to verify ID. Not a fantasy team question but a question about the new site. Does anyone know how to get field view on their smartphones? Having it like an app is annoying? I want to see my team as I do when I log into a PC. If you press on the options button just above your team it should come up with the option of either field or list view. Its in Options if i am understanding you request right.. I meant through Safari on iPhone not the app? First time posting a team on this platform, any feed back would be greatly appreciated. The squad flows but the Clarke thing gets me, he doesn’t strike me as a person who will hold his spot well. Your ruck is lacking, at the present point, only one is training, Grundy is still nursing a broken toe. And your fwd line has got 2x 750k players, which means more forward rookies, definitely gonna struggle if one or two gets dropped. 2. B smith, billings/tkelly/wingard and worpel? Mumford is out for the first 2 or 3 rounds through suspension. That forward line is… interesting. I would drop Smith/Hanley and use the money to upgrade the forwards. Hi all. Seeking comments on this. thinking bit left field. The field you’re thinking in is in another postcode. Blakely is injured for 3 months, Birchall is unlikely for R1, Deledio is history, and overall just wtf? Did you click auto fill this team or did you steal this from Hawk.? Bwahahah that’s funny one half of the brokeback mountain gang. My teams actually centre field and got the great man go for gola sitting comfortably at F1. The only way I’d ever have a team like this is is your missus was blowing me under the table again while your at work. Only a retard would have menegola at f1. Probably a compliment for you. its the ‘B’ team – all players names start with B (first or last name) But thanks for info on those you name. Thats a solid team Sam. Each year there is a core list of 40 players or so that are familiar across most teams. There’s a POD in yours in Menegola all else is from that core list and should score you well in the first few weeks then its all up to your trading. FWD: 3 0 3 Dangerfield will be F1 again and increase 5 to 10 with Menegola solid year in year out the past few and if Dunkley can continue the way he finished last season, he is underpriced by 5+. Setterfield will be in 75% of teams by should do well. RUC 1 1 0 Grundy will be along with Setterfield and Dangerfield the top three picks this yr. He finished with 150 ave over last 5 but great all yr. Has that persistent toe soreness that can be very painful, he would want to shake it before the season starts and Jacobs is 10 under or so and a good pick this yr.
DEF 2 2 2 How many rookies from GCS can we have this yr. Two more in def with Corbett in fwd, Collins a potential rookie breakout to 80 but more realistic 70+. Williams looks like he’s jumping at the new season and should go 85 or more, should be that little more than Brodie Smith. Whitfield might take Lloyd for D1 this yr.
1, still doubt on Billings finally getting to the next scoring level we have waited for the last three seasons. The majority of teams I’ve seen on here have Jack Macrae, for obvious reasons I know. Is he a must have or could you make do with saving 100k and going with Cripps/Kelly etc. Not a must but with most teams the idea of having a player likely to be one of the highest scorers is a safe option and provides a good captain choice. I have him and i think he could drop to 120-125, but again safe option with Grundy to cover captain each week and likely a consistent high weekly scorer above most. But with Merrett, both Crouches, Dusty, Adams, Sloane, Rockliff who is having great preseason with his body etc are all premiums at unders before we even list the countless midpricers. Dusty/neale and 170k fwd or hanners/miles and worpel? hmmmm… Dusty and 17..0.0……miles and worpel actually. Is the midfield too risky lads? Cripps, Zerrett, Dusty, Adams, B.Crouch, Libba, Walsh, Gibbons (Bewley,Hind)?? What are you thoughts, would love to hear what you think because I don’t really know how this team sits. 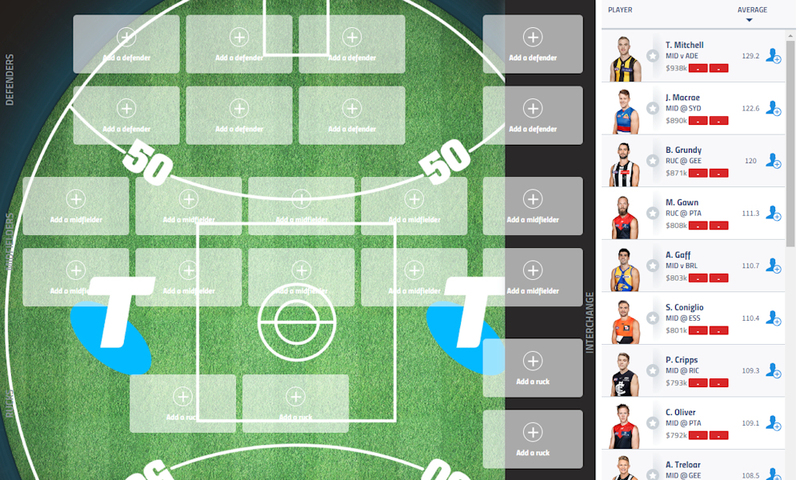 I would get Bewely on field for Libba, upgrade Scrimshaw, and not trust Greene tbh.